Juhana Moisander’s videoinstallation Ethology of a Man (2019) examines models of human group behaviour that repeat themselves from one historical era to another. The video installation was created in cooperation with a contact improvisation group and features a strong soundscape. 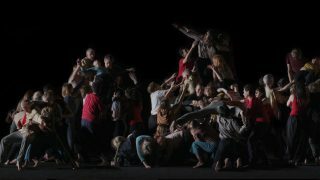 With their movements, the performers depict different scenes that show dynamics of power, such as a crowd in a frenzied ecstasy and the rise and fall of leaders. The compositions of human characters, the colour scheme and the use of light reference European Baroque paintings of the 16th and 17th centuries. For his new piece Moisander has studied altarpieces and how human groups are depicted in them and art history in general – what makes a group visually interesting. Thoughts about how surroundings and peer pressure influence an individual’s moral choices are starting points for this new piece. Juhana Moisander (b. 1977) is known for media art in which sound, image and space form a distinct relationship with a strong ambiance. He graduated as Master of Arts from the University of Art and Design Helsinki (now Aalto University) in 2007. Moisander lives and works in Karkkila, Finland. Ethology of a Man has been realised through coproduction funding by The Promotion Centre for Audiovisual Culture (AVEK) and EMMA. The work was selected on the basis of an open call held in spring 2018. Fellman’s Field is a documentary film by Kaisa Salmi commenting on the Finnish Civil War of 1918. 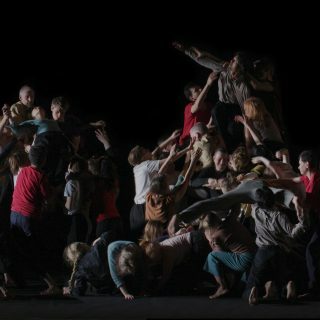 The film was shot as part of Fellman’s Field – Living Monument of 22 000 People, a large-scale participatory performance organized by Salmi in the Finnish town of Lahti in April 2013.